Sure, there have been wonderful Disney movies in the past years—the animation is improving, the storylines are becoming more complex, and the heroines are turning even more daring. But your little girl only wants Ariel and her mer-world under the sea! We couldn't agree more. 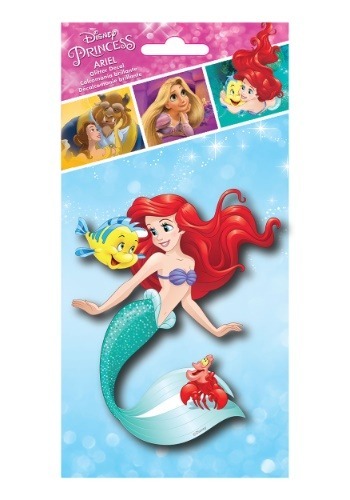 There's something about The Little Mermaid that captures kids' hearts like no other story, so if your kiddo has a bad case of mermaiditis, this Disney Princess Ariel Glitter Decal may help turn her favorite spot on land into an underwater adventure! She may want to be "part of that world" but you're happy with her right where she is. Encourage her imagination and curiosity—and keep her safe from Ursula and those creepy eels—with fun accessories like this one! This sticker features Ariel, Flounder, and Sebastian (her favorite) in a glittery design she'll love! Your girl already knows all the songs, so now it's time for her to collect all the memorabilia, starting with this 4 x 8 decal! Just beware—as your child explores Ariel's world, she may start using items in your home in odd ways. Don't be surprised if you catch her trying to fashion a dress out of your bedsheet and some rope, or if she's found brushing her hair in the mirror with a fork! It's par for the course.